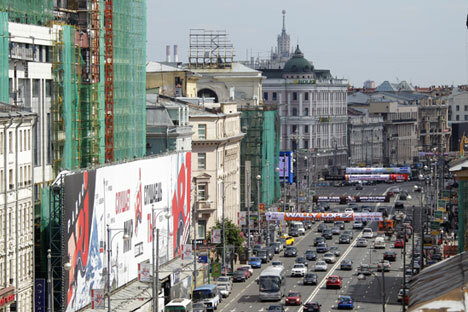 The Russian capital is looking at advanced urban advertising technology to replace large hoardings in the historic center. On Oct. 9-10, communications experts from 30 countries gathered in Moscow for the World Advertising Summit. One of the major topics discussed at the event was how digital technology and advertising are changing the way cities look, and the development prospects for advanced urban advertising technology. Russia has one of the five largest advertising markets in the world. Moscow is the biggest city in the post-Soviet sphere in terms of market size. Today in Russia, advertising spots are distributed via auction. The largest advertisers in the country are 16 multinational companies, four of which are Russian-owned. At the opening of the meeting, Moscow Mayor SergeiSobyanin said: “Three years ago, primitive ads hanging from wires in the center of the capital blocked the sky from Muscovites. The city’s historical centers were filled with them and ruined the view.” At the end of 2013, Moscow scrapped such “primitive” advertising formats and as a result, the amount of advertising in the Russian capital has dropped to approximately 1/15th of what it was a year ago. Now municipal authorities are focusing their attention on developing “a reasonable amount” of advertising in the city. Alexei Kovylov, president of the Russian Association of Communication Agencies, said that Moscow already has experience in the kind of modern digital advertising technology that participants in the World Advertising Summit agreed should be used more widely. As an example, Kovylov mentioned the Circle of Light festival, an annual event that took place from Oct. 10-14. During the festival, lighting designers and specialists in 2D and 3D graphics use Moscow’s architectural space to create multimedia and light installations. Moscow’s municipal authorities are actively developing interactive communication platforms to get feedback from locals, such as the internet portal gorod.mos.ru. On the site, Muscovites and visitors alike can find interesting information about the city, send a complaint or request, or ask questions. Sergei Moiseenko, vice president of the Russian Association of Marketing Services, praised the platform. “The growing popularity of these municipal Internet resources shows that Muscovites want channels of communication that improve the city’s image in their consciousness,” Moiseenko said.